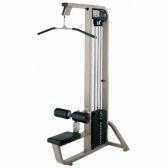 Its most important for any gym owner that the single station or dual-purpose pin weight machines provided must be aesthetically pleasing to enhance the gym environment, as today’s members are more sophisticated in their needs than ever before. The Extreme Core range of pin weight machines are a step up and beyond the normal commercial machines available, all ergonomically designed to provide a natural flowing movement, with genuine leather upholstery for durability, large 100kg weight stacks to suit all abilities, a common weight stack pillar guarantee’s consistency throughout the range, stainless steel fittings for durability, Aircraft quality cables rated over 2500lbs for durability and safety, Electrostatically applied paint finish with clear coat to maintain its great looks and prevent chipping. Extreme Core strength equipment meets the highest standards as each piece is a statement in Biomechanical Engineering Excellence. Call in to try the difference that an Extreme Core machine has to offer, our friendly staff will assist you in finding the right piece of equipment for your gym. Please note: The Extreme Core equipment is indicated in the colour black which is available on special order, but the current stock is available in a highly durable, high gloss metallic silver finish that minimizes scratching, chipping and fading.